What colour shade sail should I choose? A shade sail is a great way to shade your home or commercial property, not only can it protect from the sun and rain it looks good too. 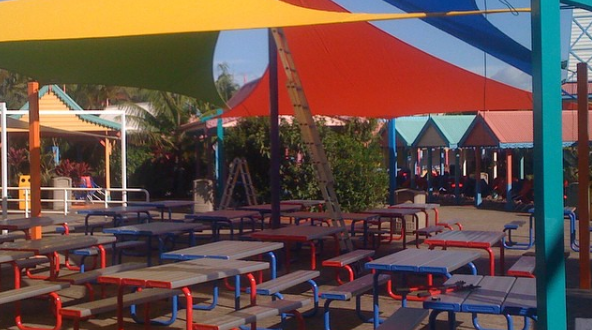 Anthony’s Shade Sails on the Gold Coast, supply, manufacture and install all their shade sails so you can customise your shade sail to suit your taste, needs and budget. This is entirely up to you, but below are a few suggestions on how to choose the perfect shade sail colour for your property. A commercial property might decide to choose colours that match their branding. If your company colours are red, why not add a red shade sail to your property and give a bit of brand recognition from the outside. A day-care might choose bright, fun colours as this is very in-keeping with the industry, much like a naturopath might choose more earthy tones. If you like the colour blue, why not choose the colour blue? Personal taste is a great way to choose your shade sail colour; however, if you are planning to sell your home with a shade sail in the near future a neutral colour will be more appealing to a wider audience. Look at the building and choose a colour that complements the architecture, whether you want to get one that blends in or one that provides a contrast, we have a wide range of colours for you to choose from. When it comes to absorbing the heat, a darker shade sail would help block UV rays as it is harder for light to penetrate; a lighter colour shade sail reflect heat, but it is easier for light to pass through it. When it comes to choosing a colour for your shade sail feel free to call us for a consultation, we can give you some handy hints and tips that you might not have thought of. Call Anthony’s Shade Sails on the Gold Coast and see how we can assist you with all your shading needs.